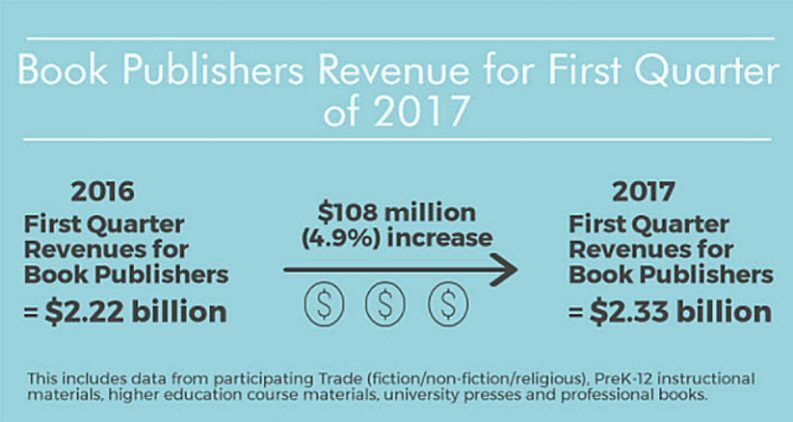 The Association of American Publishers’ StatShot program cites preliminary indications that its 1,202 publishers saw $2.33 billion in revenue in January, February, and March. 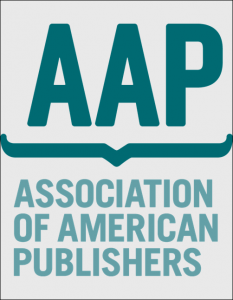 In its first-quarter report, issued on August 1, the Association of American Publishers (AAP) cites a 4.9-percent rise in US book publishers’ revenue in January, February and March, as compared to the first quarter of last year. That increase brings the total dollar amount to $2.33 billion for the 1,202 publishers reporting into the association’s “StatShot” tracking program and includes a dollar increase of $108 million over Q1 2016. The big winner, once again, appears to be the audiobook segment, with a 28.8-percent jump in revenue from downloaded audio products. 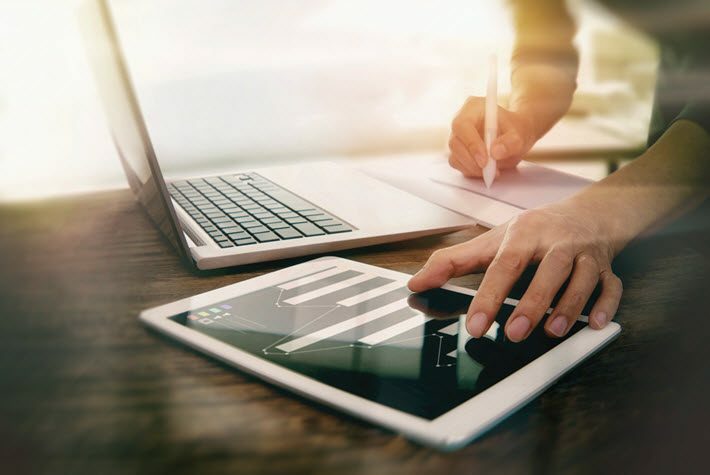 A spokesperson for the AAP points out to Publishing Perspectives that this is the third year in which the sector has registered double-digit growth in StatShot’s reports. Nevertheless, all digital products weren’t moving upward. The AAP cites a 5.3-percent decline in revenue from ebooks in the same period. 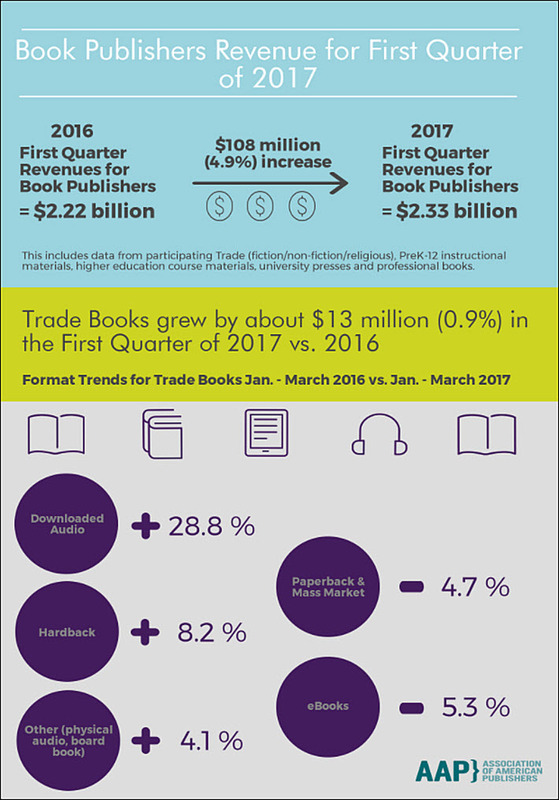 In hardback print, publishers saw an 8.2-percent growth in the first quarter of this year as compared to the first quarter of last year. “The reason the quarterly trade number isn’t higher,” says AAP communications director Marisa Bluestone, “are declines in Children’s and YA revenue in January (-6.7 percent) and February (-18.7 percent). She also tells us, “Sales of adult hardback books were up 18.1 percent for Q1” this year vs. last. “Their biggest month,” Bluestone says, “was March, when sales increased 37.5 percent over March 2016. “The other print formats for the quarter in adult books were down slightly, as were ebooks,” Bluestone says. While StatShot doesn’t get into the granularity of specific genre reporting, Bluestone confirms that she sees children’s and YA hardback and board books up in the quarter over last year, while paperbacks are responsible for most of the declines, down 14.2 percent, along with ebooks–a smaller group in children’s books, of course–down 16.3 percent. In higher education curriculum materials, “Revenues were up,” says the press statement, “by $92 million (24.3 percent) to $470.2 million in the first quarter of 2017,” the association reports, “compared to the first quarter in 2016. “Revenues for professional publishing–which includes business, medical, law, scientific and technical books–were up by $5 million (4.5 percent) to $119.5 million.,” the statement reads. It’s always interesting to look at how this kind of material is reported, of course. More on the audiobook sector’s outstanding performance is in our story from June on the Audio Publishers Association’s latest survey data. All of these figures represent publishers’ net revenue from all distribution channels, and not retailer or consumer sales figures.